Coal was, and had been deep mined in collieries in the area for at least one hundred years prior to the sinking of the Arkwright drifts. The initial sinking's were carried out in the good quality Top Hard seam from near to where the seam surfaces due to the natural uplift in the strata caused by the Brimington Anticline. The drifts were sunk this way because it is far easier to mine in coal than in rock. The nearby drifts of Calow Main colliery were sunk this way in the Blackshale seam which bassets out nearby. Arkwright colliery or 'Wangum pit', Corruption of the word wagon? Wagon pit. Wagons as opposed to tubs used to move the coal. Came into existence to exploit the coals on the Sutton estates prior to the Second World War. The colliery was designed to work an area of coal which was too remote for the Markham collieries to work at that time and a company was set up under the umbrella of the Staveley Company to mine the five hundred tons per day, the Arkwright colliery company trading as S.E. Short and company whose offices were at 7. Glumangate, Chesterfield, The founders of the which were Rex Ringham as chairman, Harold Berrisford as secretary with John Hunter and Harold Kirk as the colliery agents. S E Short was chairman of the Eckington Coal Company of J & G Wells. He was also the director of many Chesterfield firms as well as the auditor for the Bolsover. Oxcroft. Bullcroft and Hatfield Main colliery companies all of which there directed by members of the Staveley Company. Plans to increase production from the colliery culminated in the digging of a shaft for the colliery in the 1940's, a twenty one foot diameter shaft was to be constructed from the surface to the Deep Soft seam at 220 yards from the surface. 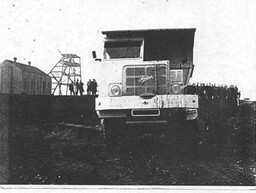 The shaft sinking was carried out by the local building firm of Kirks under the management of George Cowlishaw, not by a colliery shaft sinking teams The shaft was not completed and in 1952 after only ninety foot of brickwork had been fabricated the shaft was filled in, the winding engine house removed and the winding equipment stripped and sent to a colliery in Leicestershire. The buildings were then demolished and buried under the spoil heap not to see light of day until the colliery spoil heaps were worked again in early 1995 as part of the opencast project at Arkwright Town. In 1952 the colliery was producing coal from the Top Hard seam and was opening up the reserves of the First Waterloo seam under the management of A W Gray and F.Oldfield. By 1953 the Top Hard seam was exhausted and an increase in manpower was required to work the First Waterloo seam, this was achieved by the transfer of men from the nearby Bonds Main colliery which closed in that year. Production as a result increased by 1968 to 625,000 tons increasing further to 750,000 tons by 1975. Pit head baths were constructed in 1954 and extended in 1976. The original drifts of five hundred yards were later connected into the nearby Calow Main workings which were owned by the Staveley Company five years after their construction, the colliery expanded into the Sitwell seam during 1943-44 and later into the First Waterloo seam. As the colliery expanded and production on the faces grew due to improvements in mining technology a third drift was planned, number three drift. The new drift was connected to two ventilation fans on the surface to boost the air flow throughout the workings of the mine as by 1972 the Calow Main drifts were in a poor state of repair and were abandoned The £25,000 drift constructed in 1972 helped the colliery to work four longwall faces, two in the Second Waterloo seam, a third in the Second Ell Coal seam and the fourth in the Low Main seam. A further eighteen longwall faces were to be machined from 1982 until the planned end of the collieries life in 1991. A planned link to Markham colliery was to be constructed by 1988 into the workings of L401’s unit in the Second Piper seam of number two colliery to take the remaining coal from the Arkwright faces and out of the proposed new Markham surface drift, these plans were abandoned. The colliery was salvaged, the Calow and Arkwright drifts sealed and the men transferred or given early retirement by the collieries premature closure in April 1988. Click on map for mining plans. A silver spade first used 92 years ago for the turning of the first sod of the Old Springwell Colliery was used by Mr. D.N. Turner Chairman of the Staveley Company on Tuesday when he cut the first sod of the proposed Arkwright No2 Colliery. In asking Mr Turner to perform the ceremony for Mr R. Ringham (Collieries General Manager) of the Staveley Company said that the shaft would be 21 feet in diameter and would be sunk 220 yards into the Deep Soft seam for the ventilation of Ireland colliery workings in that seam. The winding engines and fan would be electrically driven and an oil driven standby fan would be provided. Although provided essentially for ventilation purposes it was probable that areas of coal in all seams below the Top Hards lying on the edge of the Royalty would be worked from the shaft the diameter of which was considerably larger than required for ventilation. It was decided that it could accommodate the largest type of mine car and enable the most up to date methods to be adopted. As Mr Turner turned the first sod a fanfare was sounded and the Union Jack was hoisted both at the scene of the ceremony and above the screens at the nearby Arkwright Colliery. Below. Opencast Operations in the Arkwright Area. ARKWRIGHT Early 1990’S to 2004 3,200,000 ? ?